In-flight portrait of the space shuttle Discovery’s STS-95 crew. 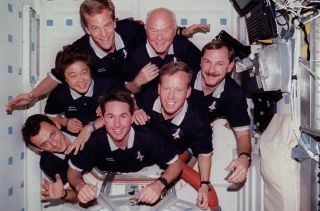 Clockwise from top left: Scott Parazynski, John Glenn, mission commander Curtis Brown Jr., Steven Lindsey, Stephen Robinson, Pedro Duque and Chiaki Naito-Mukai. Iconic astronaut John Glenn, who died Thursday (Dec. 8) at the age of 95, flew on two space missions during his long and eventful life. Both of them set records. On the first, which launched on Feb. 20, 1962, Glenn became the first American to orbit Earth. On the second — the STS-95 mission of the space shuttle Discovery, which lifted off in October 1998 — he became, at 77, the oldest person to slip Earth's bonds. Space.com: Obviously, this is a pretty sad day. How are you feeling? Stephen Robinson: I think an awful lot of people share what I'm thinking right now, which is, "The world's a smaller place without John Glenn in it." But we were fortunate to have him for 95 years. And I think so many of us were inspired not just by what he did, but by the person that he was. Space.com: I never met him. Could you tell me a little about what kind of person he was? Robinson: I think everybody who ever met him probably went away thinking, "This is the definition of a gentleman." Here's a person who could easily have considered himself above most other people, but he never did that. I saw him with royalty, presidents, and all manner of powerful people; I was in the room with him in many of those places. And I saw him with schoolkids and bus drivers and waiters. He treated everyone the same — with respect and curiosity about what they thought. And, to me, that was the most inspirational thing of all about him. Space.com: There probably aren't many people who would stay grounded like that after becoming a hero and an icon. Robinson: Yeah, and he really did. It was just his nature — and, I have to say, it wasn't just him. He and his wife Annie were as close and intertwined as any two people I've ever seen, and there wouldn't have been the John Glenn that we knew without Annie Glenn. Space.com: How did he inspire you personally? Robinson: When I was growing up, I was one of millions of kids for whom the early astronauts were completely our heroes. So when he first flew, I was around 7 years old — right around when you start developing heroes in your mind. I was John Glenn for Halloween once [laughs]. And then, 35 or so years later, I was strapped in on the shuttle Discovery, with him strapped in right next to me. That was a science-fiction moment [laughs]. Space.com: Is it true that President John F. Kennedy essentially grounded Glenn after his first flight, like the Soviets grounded [first person in space Yuri] Gagarin, out of fear of losing an icon? I stayed his close friend, and he's been kind of a mentor and adviser ever since. Space.com: Some people may think Glenn's involvement in STS-95 was some kind of a stunt. But it wasn't a stunt, right? He was a full-fledged member of that crew. Robinson: Oh, yeah. He had to be. When he was assigned to the mission — my job on the mission was called payload commander, which meant I was in charge of the science on the mission. And up to that point it was I think the biggest science mission that NASA had ever flown; it was just absolutely packed with experiments and things to do. And so when he arrived, I told him, a little bit recklessly [laughs], "You know, you're going to have to carry your load on this crew, because we can't do anything else. We need you to do as much work as anybody else." And he just basically said, "Well, of course! That's why I'm here. What do we do? Where do we get started?" And that's the way it was. Space.com: Did he talk at all about what it was like being in space again, 36 years later, on a different vehicle? What did he say about STS-95? Space.com: How do you think John Glenn will be remembered by future generations? Robinson: From my point of view, what was really special about John Glenn, and the impact he made on the American self-image with the space program, was that he was one of us. He seemed to be accessible and not distant; you could imagine him living down the street. And so, especially in the '60s, when spaceflight seemed unimaginable, just absolutely science fiction, I think he brought it home to all of us and made it seem like — I think a lot of people could see a little bit of themselves in John Glenn. By doing that, he made the space program something that we could all participate in, and I think he did that in a way that no one else ever did. Space.com: Was it his demeanor that differentiated him? What made him so much more approachable or relatable? Robinson: I don't know. It certainly came naturally to him. Again, it was part of the team between John Glenn and Annie Glenn — that's just the way they were. Annie was a little bit behind-the-curtain, but together they were very strong, magnetic, wonderful people to be around. Everybody wanted to be around them, and every minute I've been around them I've enjoyed. And I've been inspired, from the time I was 7, until now, in his old age. Space.com: Is there anything else that you think people should know about John Glenn? Robinson: Here's a man who will never be forgotten, and his inspiration probably changed millions of lives one way or another. In my mind, he wasn't a great man because of his accomplishments. He accomplished so much because he was a great man. That really came first.